Thanksgiving is not only a time to gather with loved-ones and reflect on all that you have to be thankful for, it is also a good time to help children learn about historic events and have some fun along the way. Plan a Thanksgiving party for elementary school kids by including crafts, games, and activities. Use simple fall colored streamers, butcher paper and plastic tablecloths to create a festive party room for any grade level. 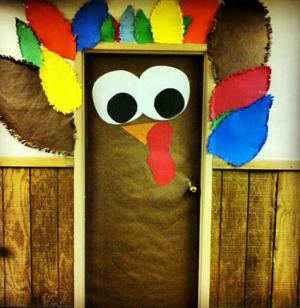 Start with a great door decoration featuring a turkey or a festive bulletin board with iconic Thanksgiving characters. Gather fallen leaves to use as table scatter decorations. Pumpkins and gourds are appropriate decorations at Thanksgiving. Paper cutouts of turkeys, pumpkins and fall leaves can be hung on bulletin boards or around the room's perimeter. Cover tables with brown or yellow paper. Tie orange, brown, and yellow helium balloons to the back of each child's chair. Place one or two hay bales in the corner of the classroom, and group large and small pumpkins, dried Indian corn, and gourds on and around the bales. You can also engage children in Thanksgiving arts and crafts prior to the party which can be used to decorate the room. Lower grades will need simpler games and activities, along with some potential helpers to complete crafts. Young elementary school aged children love hands-on crafts. Have several parent helpers available to assist kids as needed. Pre-cut strips of blue construction paper to an approximate length that would fit around a child's head. Scallop the upper edge to look like waves and staple the ends together to create a headband. During the party, help the children cut a boat shape out of brown construction paper and triangle sails out of white paper. Tape a straw to the center of the brown boat and tape the white sails to the straw to create a Mayflower. Then using packing tape to secure the Mayflower to the inside of the water headband so it looks like the boat is in the water. Hand turkeys: Cut out several hand outlines, each on a different colored paper, and glue these hands to the back side of a toilet paper roll. The toilet paper roll serves as the turkey's body when eyes and a beak are added. The hand outlines should be staggered so all the colors show and becomes the feathers. 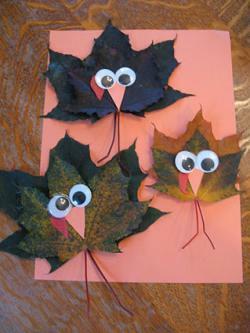 Leaf turkeys: Choose a large colorful leaf, add googly eyes and an orange triangle to create a beak to make a turkey. First and second graders can paste a smaller leaf to a larger leaf for a more dimensional look. The two stems will then act as the turkey's legs. Rock turkeys: Allow children to choose a rock. Add googly eyes and an orange paper triangle to create a turkey face and body. Tape real leaves to the back of the rock to create the tail feathers. Hand print Mayflower: Use brown paint to make a hand print on white paper. Cut sails out of white paper and glue them to the three middle fingers. Then paint blue water to the bottom of the page and clouds and a sun in the sky to create a picture of the Mayflower sailing the ocean blue. Leaf tiara: Make a headband out of construction paper. Then allow children to paste leaves on the headband to create a tiara. You can use real or silk leaves or cut some out of construction paper. Garland: Supply students with brown yarn approximately three feet long. Let kids tape the stems of fallen leaves to the yarn. Space the leaves about five inches apart to create a garland. Add some games to keep kids busy after they have been sitting for a while working on crafts. How Many Candy Corns in a Jar? Fill a jar with candy corn and ask each student to guess how many pieces in the jar. Supply slips of paper and pencils and remind students to include their name on their guess. The student whose guess is closest to the correct number can win a prize. Help the youngest students write their guesses if necessary. Click to print the scavenger hunt list. 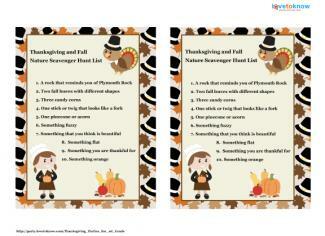 Use the printable scavenger hunt sheets to create a Thanksgiving-themed scavenger hunt for students. Print them using Adobe, cut them out, and paste to brown paper bags. Allow the students a set number of time to find all the items on the list. Give each winner a special treat such as a piece of candy or a Thanksgiving-themed pencil. This game is best for first and second graders who are able to read. Use poster board to create a simple turkey image without tail feathers. Cut feathers out of construction paper and have each student write his or her name on a feather and then play a traditional round of Pin the Tail on the Donkey. The students who get their feathers in the proper spots can be declared the winners. Preschoolers and kindergarteners will really enjoy this variation of the classic game. Engage children in activities to entertain them at a Thanksgiving party. Invite children to walk in a parade around the playground or in the halls. Ask other classes or parents to watch. Consider creating Thanksgiving costumes for the parade if you have time or a parent volunteers. Ask the children to gobble like turkeys or carry their crafts as they walk; this is best for the youngest grade levels. 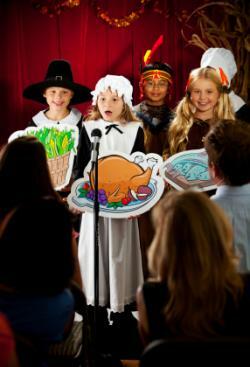 Reenact the first Thanksgiving or have children recite Thanksgiving poem stanzas at the front of the class for parents or other grade levels. First and second graders are able to memorize a short line for this activity. Ask preschool and kindergartners to draw images of what thankful for on a sheet of paper; first and second graders can write several sentences to accompany their pictures. Once all the pages have been completed, have them stapled or added to a binder in clear plastic sleeves to create a book. At the end of class, read the book. Older elementary students will also appreciate fun crafts, games, and activities that are slightly more mature at their Thanksgiving party. A Thanksgiving craft can be used as an artful activity that can double as a gift for parents or grandparents. Wreaths are a great autumn decoration and are simple enough for the younger third grade children to make mostly on their own. Use paper plates with circles cut out of the centers as a bass for the wreaths. Go on a nature walk with your students and allow them collect nature items that they think is beautiful such as colorful leaves, twigs, and pine cones. Ask students to glue them to the paper plate. Some heavier items might need to be attached with a hot glue gun and will require adult supervision. A simple and thought provoking activity for older third, fourth, and fifth grade students is creating a gratitude tree. Cut bare branches of a tree and put them in a large vase with rocks to keep them in place. Then invite students to cut leaf shapes out of construction paper and ask them to write down the things they are most thankful for. 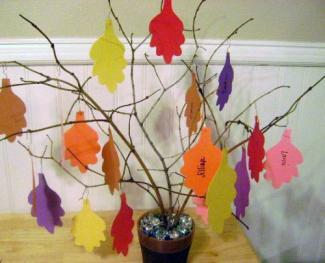 Tape the leaves to the branches to create a Gratitude Tree. Ask parents to provide a mason jar for their child. During craft time, place silk fall leaves to the outside of the jar and cover it with Mod Podge. Allow the jars to dry before sending them home to be used as a Thanksgiving dinner candle holder. Games for upper elementary kids can be more involved. Cut two strings about five feet long and attach one end of each string to the wall, approximately four feet up from the floor and a couple of feet apart. Have students cut out turkey shapes out of construction paper or craft foam and attach a drinking straw (horizontally) to the back side. Two at a time, have the children put one string through each straw. Have the kids wiggle and shake the string and try to make their turkey get to the wall. The student whose turkey reaches the wall first is declared the winner of that round. If time permits, allow all the winners to play each other in a championship round. 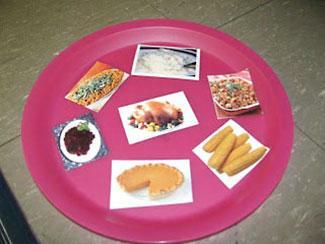 Cut pictures of Thanksgiving related food out of magazines. Put the food cut outs onto a table and divide students into two teams. Have the teams stand in two lines and hand the first player on each team a paper plate. Each player is to race to the table and put a food image onto their plate and race back to hand the plate to the next player on their team without having their food blow off the plate. The players are not allowed to hold the food down in any way. The first team to get a certain number of food items across the finish line is declared the winner. Use packing tape to attach a paint stirrer to a paper plate to create a faux pan with handle. Then divide students into two teams and have them stand in two lines. Put an inflated brown balloon on the first players' plates on each team. At the "go" signal, the students players will pass the "hot bun" from one player to the next using the . The team who gets their balloon to the end of the line first is declared the winning team. Activities are a great way to keep the party interesting without the distraction of competition. 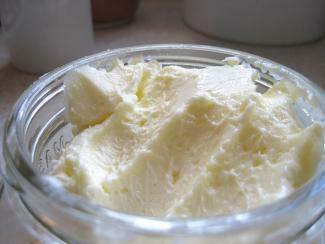 Help kids create real butter, something the Pilgrims would have spent some time doing for their Thanksgiving feast. Be sure to find out about any possible food allergies or sensitivities for the students before allowing them to try the homemade butter. Warm some heavy whipping cream to room temperature and pour some a small container with a lid. Allow the kids to start shaking the jars. Since this requires a great deal of shaking, you may decide to divide the students into groups and share the jars. After a few minutes the cream will thicken to become whipped cream and after even more shaking the cream will separate. Pour the buttermilk out and you will be left with a ball of butter. Provide some bread or crackers so the students can all share a bite of their hard work. Kids in this age bracket love photo booths, so create one at your class party. Create a background out of fall colored butcher paper and provide photo booth props for the students to wear and hold. 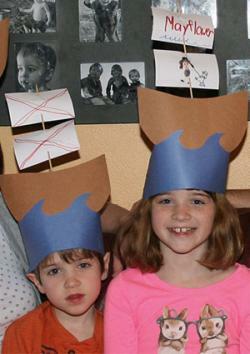 Provide Thanksgiving-themed items such Pilgrim hats and bonnets, Native American headdresses, and footballs. You can also provide generic items such as over-sized glasses and bow ties and funny hats. Print, cut and mount these props onto chopsticks or straws. Ask a parent volunteer or classroom parent to snap photos of the kids and then print images for students to take home at the end of the day. Before class cut strips of paper and write random nouns on the slips. For example, you could write things such as snow, plants, the bus driver, the zoo or a book, on the papers. Then place them all in a bowl and have the students each draw a slip out of the bowl. Then ask the children to write a paragraph about why they are thankful for that person, place or thing. This exercise is a good way to help students think about gratitude and a good way to practice their writing skills from third through fifth grade. Whatever you serve, go around the room and give each child an opportunity to share something he or she is thankful for. This really emphasizes the true spirit of this holiday. 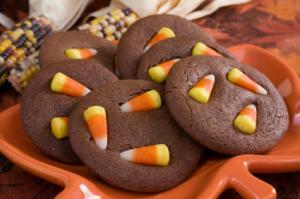 The party food can be as simple as Thanksgiving or fall-themed cookies and juice. This is great for lower age levels who may be pickier about their food than older students. However, if the upper grades need to fit more school work into the day, leaving less time for the party, snacks after their regular lunch hour would work for them, too. Parents can supply a mini Thanksgiving dinner using sliced turkey lunch meat, corn, potatoes, cranberry sauce, and pumpkin pie. Older students, around fourth or fifth grade, might be able to participate in making some Thanksgiving cooking activities that result in dishes or sides that can be served at the mini meal. Another fun idea would be to show the children the Peanuts special A Charlie Brown Thanksgiving, and then recreate Snoopy's dinner of popcorn, buttered toast, pretzel sticks, and jelly beans. The class Thanksgiving party is usually planned by the teacher and at least one room parent who helps coordinate everything. About two weeks ahead of the party, the teacher and the room parent should discuss the party and decide how long it's going to last and which activities and treats will be offered to the students. No less than one week ahead of the party, it's time for the room parent to contact other parents from the class to ask if they can donate specific items for the party. Parents need to know exactly how many of each item is needed so there are no shortages and no child is left out. The room parent should also line up one or two more parents to attend the party and help out as needed. Since this holiday also provides an excellent opportunity for the children to learn a little about their country's history, the morning of party day could be devoted to learning, and then the party could take place later in the afternoon. You could certainly hold an elaborate Thanksgiving party if you have enough parent help to pull it off, but it's really not necessary. At this age, 1st graders are easily entertained, and their party should include some free time for them to socialize with each other. You want to strike a nice balance between free time and just enough supervised activities to keep the party in hand and fun for everyone.